My second field of interest this year was Ayahuasca. My interest was piqued after reading an interview with ethnobotanist Wade Davis (famous for his studies of Haitian zombies and the resulting book, The Serpent and the Rainbow) and his research into native medicinal and healing plants. Ayahuasca is the generic name for a group of vines that grows wild in the Amazon and when ingested in a specially made tea concoction, induces hours long psychedelic/psychotropic visions. The drink is traditionally taken in a communal ceremony led by Amazonian shaman who oversee and guide the users with special rituals including chants, music and verbal guidance. I had a friend who tried it in South America and her experiences seemed really fascinating. Apparently, it’s like going through three years of psycho-therapy in one long overnight session. 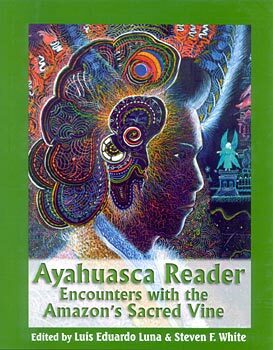 I read three or four titles on the subject but I most enjoyed the Ayahuasca Reader : Encounters with the Amazon’s Sacred Vine by Luis Eduardo Luna (Editor), Steven F. White (Editor), Steven F. White (Author), Luis Eduardo Luna (Author). It’s a collection of first hand experiences, essays and studies on the plant. The best bits are the descriptions of the Ayahuasca trips, they sound amazing – lots of brilliant colors and shapes, terrifying animals, sparkles and sometimes the vine itself speaks to them! The image on the cover of the book is a visual interpretation of an Ayahuasca “journey.” I can’t remember but it might’ve even been drawn while under the influence of the vine. It’s very similar to Huichol art which is inspired by the ritual use of peyote. You wrote “like going through three years of psycho-therapy in one long overnight”. Does this mean it has emotional benefits for people who are bipolar or have mental problems? Ayahuasca is becoming chic – did you read that article in the LA Times magazine around February of ’08 about how it’s becoming the drug of the affluent here in Southern California? People have hip ayahuasca parties and what-not. It’s kind of sad…although the sight of a bunch of Silver Lake hipsters throwing up all over the place after drinking their first batch would be priceless! I have a couple of friends who have traveled to do it…met up with a shaman…the whole 9. I suppose the benefits are open to interpretation but according to many of the accounts I’ve read, people report feeling cleansed, refreshed and illuminated after their experiences. The friend of mine who tried it said it helped him work through some lingering deep rooted issues he was going through. However, the positive trips were all done with shaman guides and after following proscribed rituals such as eating certain foods for a week beforehand etc. I’ve heard of stories about other people trying Ayahuasca without any preparation and feeling near the edge of insanity. Oh, shudder! I hadn’t read the article and I’m not surprised to hear it’s the new chic drug of choice, so many poseurs round these parts. I actually met Wade Davis once upon a time many years ago. He came into the bookstore where I was working but left before he could order the book he wanted because his baby’s ecologically correct but functionally challenged diapers were leaking.